Good honey-wheat dinner rolls have the softness of white rolls, with satisfying heft and a nutty whole-wheat flavor that’s complemented by a touch of floral sweetness. That said, these appealing rolls rarely hit the mark: Commercial versions are soft but taste artificially sweet, while homemade rolls have good flavor but can be as dense as wet sand. 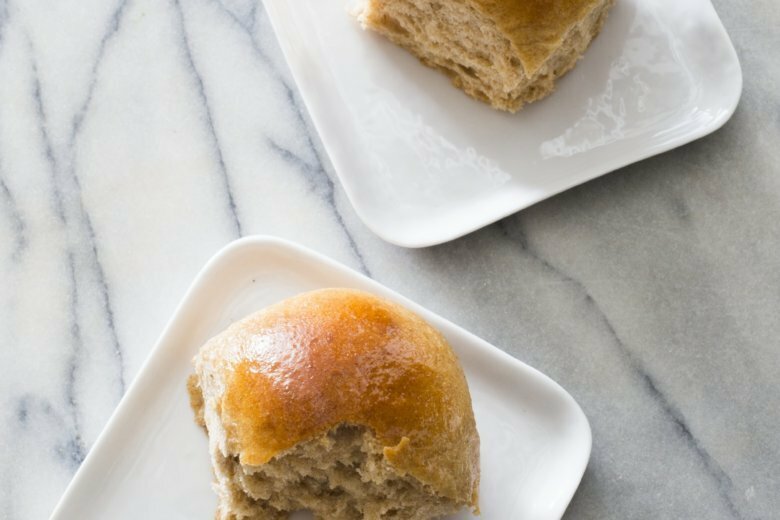 We wanted a flavorful alternative to white rolls that was tender and fluffy and that actually tasted like its namesake ingredients. What makes achieving great whole-wheat breads so difficult is the presence of the bran. This part of the grain, which is removed from white flour, gives whole-wheat flour its distinct hearty flavor. But the bran is sharp_so sharp that it cuts through the bread’s gluten structure, leaving you with a dense product. To produce a light, fluffy whole-wheat roll, we’d have to incorporate some all-purpose flour_but not so much that we’d lose the roll’s earthy, nutty whole-wheat flavor. We also had success when we made a very wet dough. The excess liquid softened the bran’s edges, ensuring that it didn’t wreak havoc on the dough’s structure. To boost the honey flavor, we used 6 tablespoons instead of the 2 tablespoons that many recipes call for. As a bonus, the liquid honey hydrated the dough further and contributed softness. And to make sure the flavor came through loud and clear, we brushed the warm baked rolls with honey butter. With this finishing touch, our fluffy, pleasantly sweet, nutty-tasting rolls really earned their honey-wheat title. Whisk whole-wheat flour, all-purpose flour, yeast, and salt together in bowl of stand mixer. Whisk milk, 6 tablespoons honey, 4 tablespoons melted butter, and egg in 4-cup liquid measuring cup until honey has dissolved. Make foil sling for 13-by 9-inch baking dish by folding 2 long sheets of aluminum foil; first sheet should be 13 inches wide and second sheet should be 9 inches wide. Lay sheets of foil in dish perpendicular to each other, with extra foil hanging over edges of dish. Push foil into corners and up sides of dish, smoothing foil flush to dish, then spray foil with vegetable oil spray. Press down on dough to deflate. Transfer dough to clean counter and stretch into even 15-inch log. Cut log into 15 equal pieces (about 2 1/2 ounces each) and cover loosely with greased plastic. Working with 1 piece of dough at a time (keep remaining pieces covered), form into rough ball by stretching dough around your thumbs and pinching edges together so that top is smooth. Place ball seam side down on clean counter and, using your cupped hand, drag in small circles until dough feels taut and round. Adjust oven rack to lower-middle position and heat oven to 350 F. Gently brush rolls with egg mixture and bake until golden brown, 25 to 30 minutes, rotating dish halfway through baking. Combine remaining honey and melted butter in bowl. Let rolls cool in dish for 15 minutes. Using foil overhang, transfer rolls to wire rack and brush with honey mixture. Serve warm or at room temperature. Nutrition information per serving: 211 calories; 54 calories from fat; 6 g fat (3 g saturated; 0 g trans fats); 42 mg cholesterol; 372 mg sodium; 35 g carbohydrate; 3 g fiber; 9 g sugar; 6 g protein.